Finally posting the ice cream party we threw for our daughters 11th birthday a few years ago. Here’s a bunch of pics we took on the day. 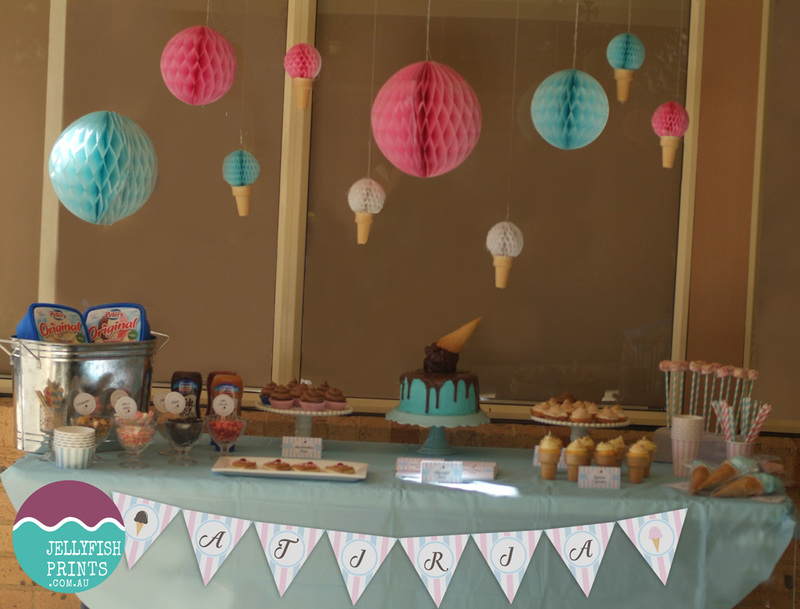 We set up the dessert table with cake and goodies and a self serve ice cream station that the kids loved. For the backdrop we purchased some honey comb balls in pink, blue and white and strung them up with white cotton. We made some cute mini ice creams with the smallest sized balls and real ice cream cones. Now I had a blast making this cake. This was my first attempt at a butter cream frosted cake and it tasted divine. You can’t see it in this picture but we made a Neapolitan flavoured cake with three layers – Chocolate, strawberry and vanilla with buttercream icing in between layers. 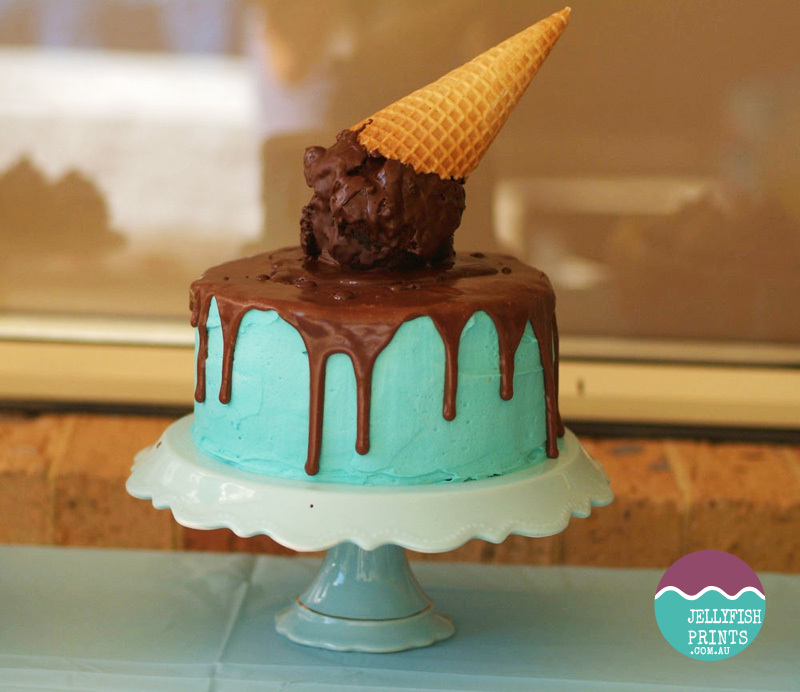 It’s smothered in a yummy blue vanilla buttercream and topped with a chocolate ganache dripping over the sides like a melting ice cream. We popped an ice cream cone topper on the top. The ice cream scoop is chocolate cake squished into a ball and covered with Ice Magic chocolate topping (Cottees brand) It was supposed to have sprinkles and these cute blue balls on top but I totally forgot them, oh well it still looked fantastic. Shout out to Kmart that was selling the perfect cake stand for only $10. 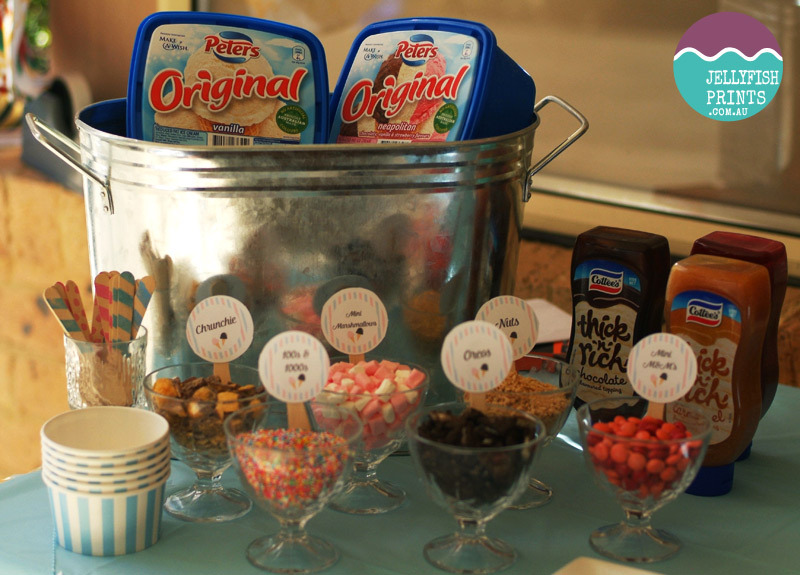 We set out all the ingredients to make your own ice cream sundae dessert. This was a real hit with the kids. We bought a bunch of ice cream sundae cups from the Reject store. The bamboo spoons were bought online and hand stamped them with blue and pink ink to match the party theme. For instructions you can see our hand stamped spoons tutorial. We filled 6 actual sundae glasses with different toppings like 100’s and 1000’s sprinkles, chopped nuts and M&Ms. We printed our Jellyfish Prints ice cream labels onto white card, cut them out and adhered them to the small ice cream spoons then stood them up in the toppings. We set out a couple of cans of whipped cream along with some chocolate, caramel and strawberry sauce toppings. Popped some ice in the metal tub we picked up from Masters hardware store to keep the ice cream cold and we were good to go. 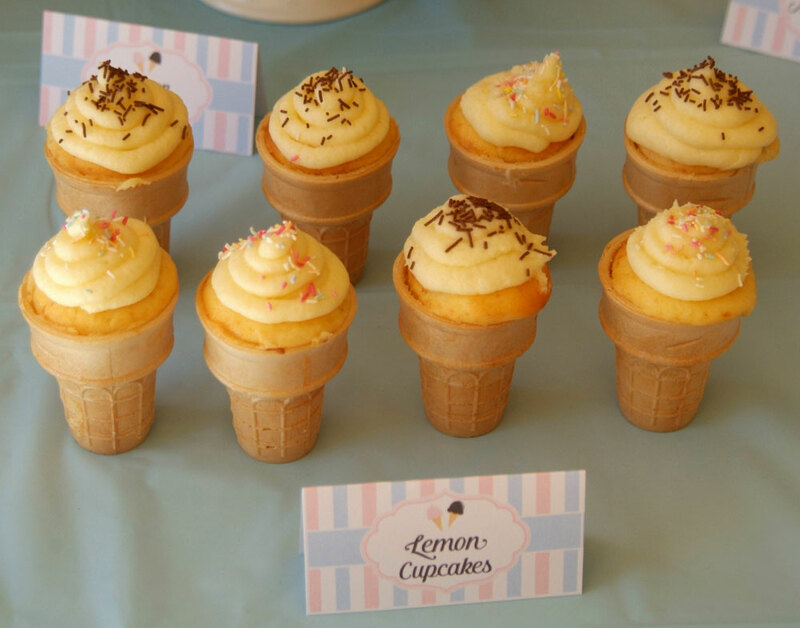 Lemon ice cream cone cupcakes – seriously cute right. These were super easy to make and fit the theme perfectly. Can you tell I’m still on my piping frosting learner’s license. I’ll get there one day and my piping skills will reign supreme. 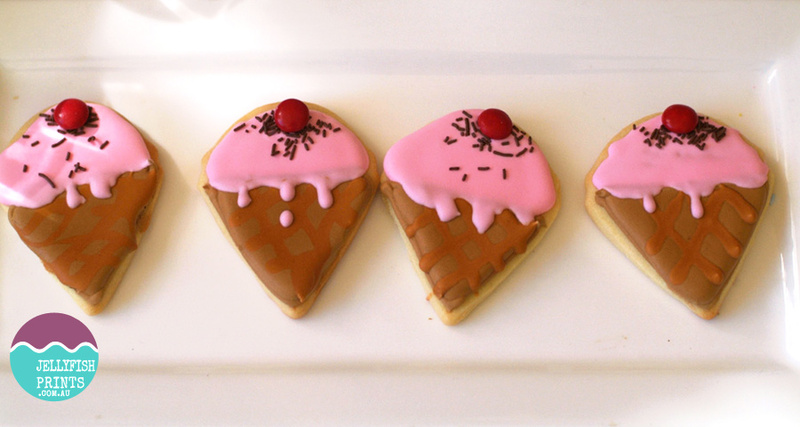 Ice cream cone sugar cookies. I made these cookies using this best sugar cookie recipe ever. This is my new favourite sugar cookie recipe, super easy and it made a heap of cookies. There was so much cookie dough I saved a quarter of the mix to make some mini tart cases for the mini lemon meringues. The only thing I would do differently is leave out the almond essence. It tasted nice but I think I’d like the them better without the almond. I bought some royal icing mix from Coles supermarket. 1 packet was enough to ice a dozen cookies with plenty left over. The cases were made from rolling out the left over sugar cookie dough and cutting out some rounds big enough to press into a cupcake pan. I baked the cases then filled with a lemon curd. Topped it with a meringue mix and baked again until cooked. 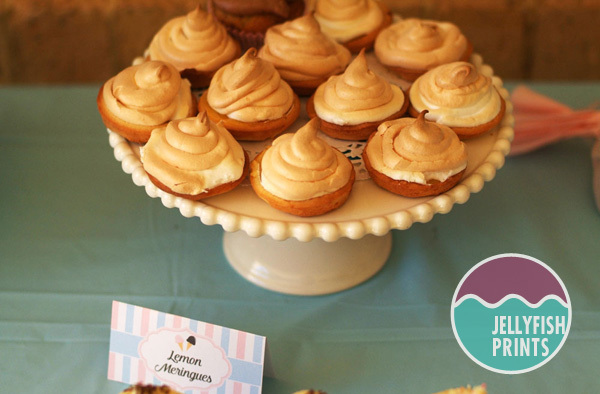 They tasted amazing and have become a regular go to dessert treat at our house. We had a couple of planned games to keep the kids entertained for a bit. 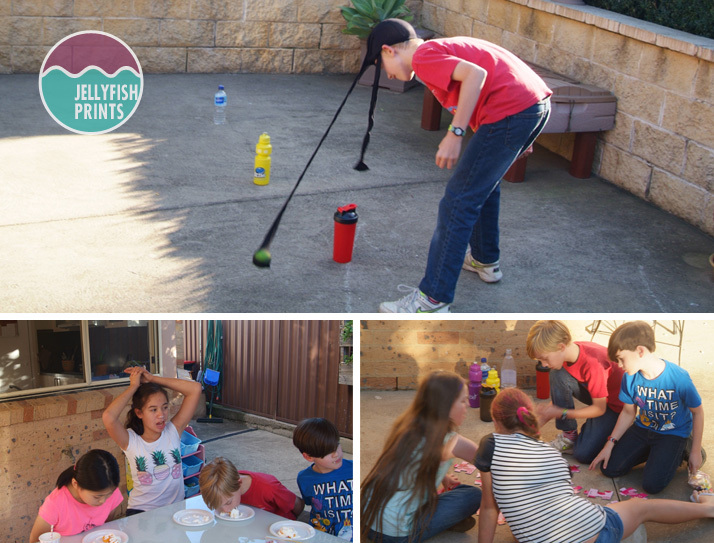 We opted for a few ridiculous funny games with simple supplies we could find around the house. For the most part they were happy to just hang out. Relay race – split into two teams, each team member had to race with a balloon between their legs to a cricket wicket. Pop the balloon, spin around the wicket 10 times, race back to tag the next player. Once they had all gone through once each team had to put together a large toddlers alphabet jigsaw puzzle without the picture to finish. Great team work game. Elephant March Game – A minute to win it game that we changed to a relay. The kids had wear a elephant trunk made with a a pair of stockings and tennis ball on their heads to knock over a series of water bottles. It was pretty funny and the kids were in fits of laughter. Left over Squirty cream and snacks game – We had a couple of cans of whipped cream and some cheezles left after the kids had eaten so we piled up some plastic plates with cheezles, squirted a mountain of cream on top then had a race to see who would finish first. Games like this are easy to make up on the go. The sillier and messier they are the more fun they will be, guaranteed! 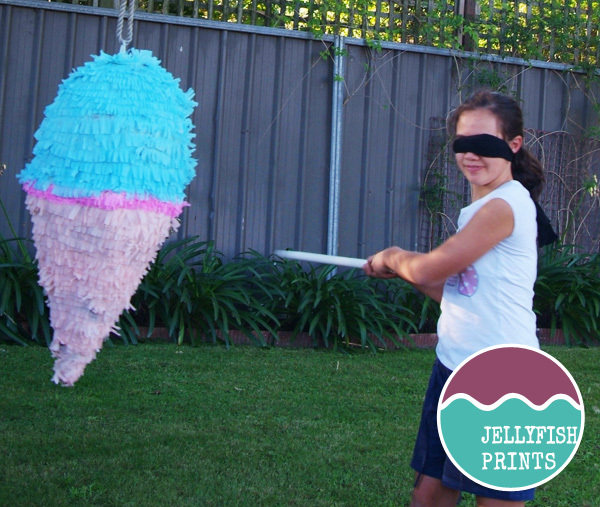 As well as the party games above we just had to make a Pinata. We made it with a gigantic balloon from Toys R Us and some large pieces of a3 cardboard from kmart. Filled it with a ton of lollies. 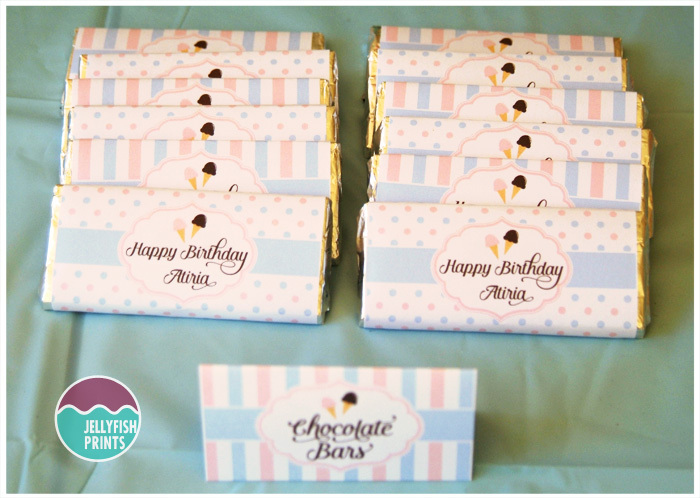 Aldi Choceur chocolates wrapped in our Ice Cream party themed chocolate wrappers. so cute and yum. Party guests were given a ice cream cone party favour to take home. We dipped waffle cones in white chocolate and sprinkles. They were filled with blue candy floss and wrapped in a cellophane bag. 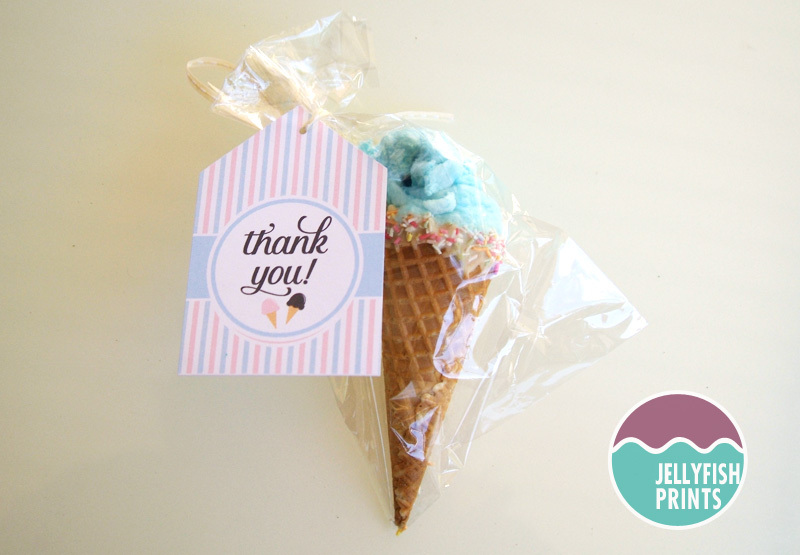 The printable “Thank You” party tag was attached with a piece of white ribbon. All in all, it was a great day and everyone had fun.